Marilyn Little rides RF Quarterman through the Sawgrass Water fence during Cross Country at the Red Hills International Horse Trials in Tallahassee, Florida. 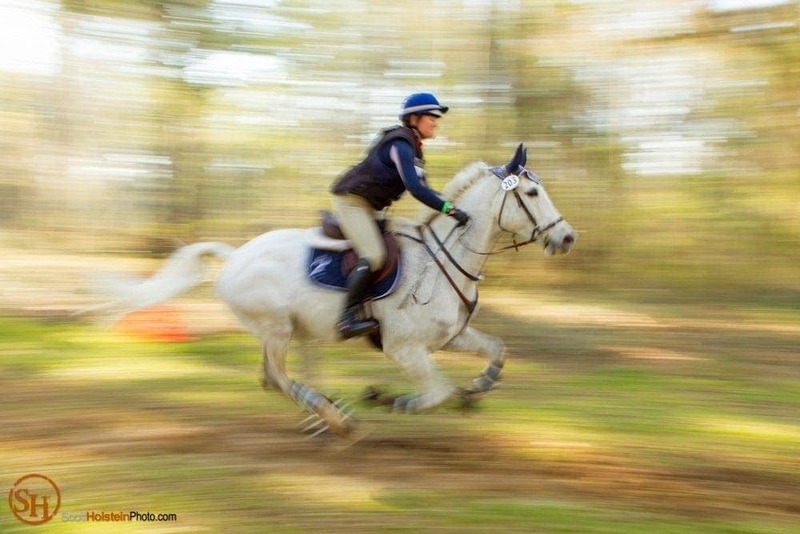 The Red Hills International Horse Trials is one of the best events Tallahassee photographers can shoot. It’s outdoors in the capital city in the spring, the season of perfect weather in northwest Florida. 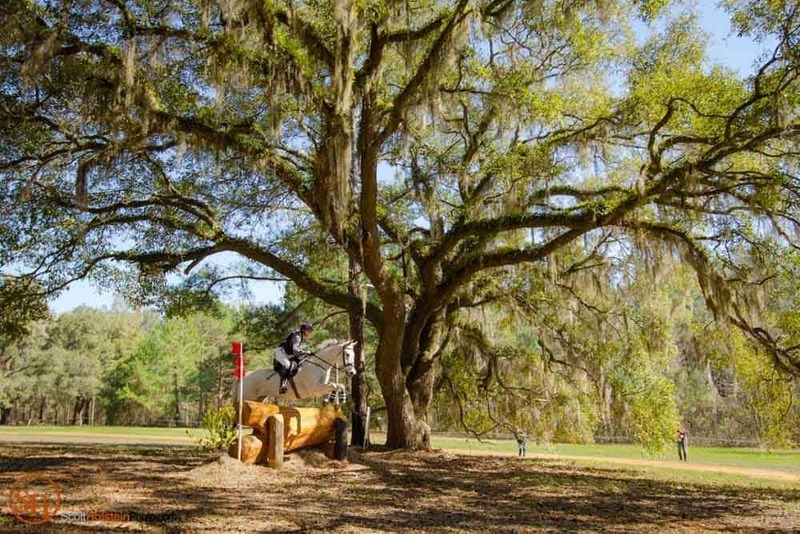 Resurrection fern-covered and Spanish moss-draped Southern Live Oak trees create a picture-perfect backdrop for the equestrian event, held in beautiful Elinor Klapp-Phipps Park on the north side of town, near Lake Jackson. The Cross Country course, designed by Hugh Lochore, is my favorite, mixing adventure, athleticism, risk, and triumph. Plus, spectators are close to the action; rider and horse together leap over jumps mere feet away. It’s difficult not to hold one’s breath each time the pounding hooves go silent as they leave the ground and go airborne. Also exciting is the spray of water jettisoned into the air as horse and rider enter a water obstacle, such as the Sawgrass Water fence. I like the challenge of catching and preserving a moment while shooting action, and I’m grateful as a Tallahassee photographer that I can photograph the Red Hills International Horse Trials. I hope you enjoy this selection of my best images from the Cross Country phase. Please click on an image to license it or to purchase prints. More images are available in my photo archive here. Katherine Rivera rides Royal Lufttanzer over the Shire Bound Trunk fence during Cross Country at the Red Hills International Horse Trials in Tallahassee. Jennie Jarnstrom rides Cape Town over the Hammock fence during Cross Country at the Red Hills International Horse Trials in Tallahassee. Lisa Barry rides F.I.S. Prince Charming over the Hammock fence during Cross Country at the Red Hills International Horse Trials in Tallahassee. Mikka Kuchta rides Rubens D’Ysieux in a blur toward the Hog House fence during Cross Country at the Red Hills International Horse Trials in Tallahassee. Kelly Prather rides Blackfoot Mystery through the Sawgrass Water fence during Cross Country at the Red Hills International Horse Trials in Tallahassee. Marilyn Little smiles as she rides RF Quarterman through the Sawgrass Water fence during Cross Country at the Red Hills International Horse Trials in Tallahassee. Caroline Martin and Quantum Solace stumble on the Sawgrass Water fence during Cross Country at the Red Hills International Horse Trials in Tallahassee. Caroline Martin clings to Quantum Solace’s neck after the horse stumbled on the Sawgrass Water fence during Cross Country at the Red Hills International Horse Trials in Tallahassee. (Animation) Quantum Solace stumbles in the Sawgrass Water fence, nearly throwing rider Caroline Martin.